At a glance. What is Knowee? 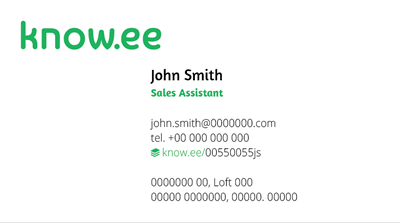 Knowee fills the gap between traditional business cards and electronic contacts, providing cards with some modern and useful functionality, while maintaining the same old scheme: physical cards, as a separate element from Outlook© or Gmail© contacts. You can have your own card in the system and share it with anyone you want in different ways. In fact, you can have several cards, and share the card you prefer. Instead of storing lots of cards in your drawer and spending precious time when trying to find a card that you need, now you can have all your cards stored digitally in Card Holder and search them by any field you remember to find the one you need. This storage is in the cloud, so you can access it from Internet. Lots of helpful functionality is available to search and annotate cards, to locate in the world where you received it, to export it to your contact manager, to send it to anyone and much more. We create a website for your card that interactively holds all the information you decided to include for that given card. This site will be accessible only for people who you share your card with, who scan your QR-Code, or who click on the thumbnail-hyperlink that we provide you. The mobile app (available for iPhone and Android) let you take your card holder and your own cards with you to share and exchange them on the go. Appoint a meeting through Gmail calendar or Outlook, invite the “Knowee Steward” and each guest will receive the cards all attendees have selected to share. A lot of work under the covers to make sure Knowee is useful, easy to use, robust and safe. What does Knowee do for me? Once you introduce your business card in Knowee, you relieve your contacts from the burden of scanning, typing, double-checking, sorting, archiving and stacking it. They will be thankful to you! When you want, your contacts will find the digital version of your card and will be able to store it or download it directly to Outlook or to their smartphone, without the hassle of scanning, typing, double-checking, sorting, archiving and stacking it. Once you start using Knowee you keep track of all the cards you have viewed. You can sort and search through them, including by the date and location where you saw it the first time. This is what we call “Card Holder”. Do I have to register to use Knowee? Open the link you received via SMS, Whatsapp or email from someone who shared his or her card with you. However, you may want to register to enjoy the full advantage of our system: introduce your own card(s), keep your stack of cards digitally organized and be able to share your cards in the Knowee way. Why does Knowee verify my email? Your email is the main way of communication with Knowee and we need to make sure that it is correct and that belongs to you. It is also a measure of security and to prevent abuse. It may have been treated as Spam. Please look in your Spam folder. If you find it there, please add Knowee as a trusted sender. If it is not there something went wrong. Please, type your email again, and we’ll send you a copy. For security reasons, we will keep your registration information for 24 hours. After that time you will have to register again. Please, check you are using the same email address you used for registration. If you are, it is likely that there was a misspelling when typing in your email. Please, register again at Knowee. Right below the user/password boxes there are instructions to retrieve your forgotten password. Uff! The only way we can know who you are is the email. You can search your mailbox and try to find the email verification communication that we sent you at registration. You can search the term “Knowee”, and most probably it will show up if it is still there. If you have created a card with a different email account and you verified that mail box, we can probably fix it. Contact us, please. Otherwise, we don’t have clear ways to fix this situation, but please, contact us and we’ll do our best. Do I have to introduce my card? Yes, this is the idea of Knowee. Go to the section “MY CARDS”, click on the button “New Card” and introduce your data. Make sure you do it correctly as once you exchange it with someone you will not be able to change it as it would happen when you give a physical card. You make the effort once and relieve the others from the pain of typing, scanning and checking it, again and again. What is a Card Alias? The card Alias is the “Name” you give to each of your cards to identify them, e.g. “Personal”, “Business-no-cell”. What kind of pictures can I use for my card? Ideally you would introduce your portrait and the front and reverse of your physical card. These images are very useful when you give your card to someone to identify you. Any JPG, TIFF, PNG, or BMP image of less than 4 MB is allowed. Can I create more than one card? Yes. You can introduce several business (or personal) cards. Think of this as real cards - In one card you can include your cellular, while in another just have the address. This will allow you to control the information you share with your contacts. Who would have access to my card? Your card will be accessible to anyone you have shared it with and to those who have the Knowee code or the QR code of your card. Sharing a card’s Knowee code or the QR is in fact sharing the card. Please refer to the next section to know more about Knowee codes. What is a Knowee code? How are Knowee Codes assigned? Codes are generated randomly to improve security. Also, numbers 0 and 1 and letters O and L are not used to prevent confusion. Sometimes, the Code we generate may have a meaning to you. Please, let us know, and we’ll fix it. Can I choose my Knowee Code? Why do you change the Code when I modify my card? Any assigned Knowee Code represents a unique physical card. When you modify your card it is in fact a different card and this is the Know.ee philosophy. Once someone has seen your card because you shared the Knowee Code or the QR, we consider that its information should get frozen as it occurs with a physical card. If the viewer returns after some time to the same Code, the information remains exactly the same. However, you can change the pictures included in your card without getting a new code (portrait, and front and reverse of your physical card) and every time someone looks at your card will see the new pictures. Know.ee will not change the code if you make changes in a card that has not been shared yet. So please, make sure the information in your card is correct before sharing with others and/or printing the Knowee code or QR in your physical card. There are several ways for you to share your Knowee Card. Remember that your Knowee code is a direct link to your card, so sharing a card's code is in fact sharing that card. The fastest and easiest one is using the iPhone and Android Apps, available in the corresponding markets or shops. Choose how you want to share it: SMS, Whatsapp, email or copy to the clipboard. That's it. If both of you have the App in your mobiles and have created your cards in Knowee, tap on the QR code and scan the QR codes in both phones. The cards are exchanged in seconds and added to your card holders. If you have your QR code printed in your physical card, anyone can scan it and will be directed to the online version of your card. If you have your Knowee code printed in your physical card, anyone can type it in the Knowee website and access your card. Anyone can take a picture of your card and upload it in the Knowee website. Know.ee will find the code or the QR and will direct the user to your card without the need to type anyting. Can I use my card as my email signature? You can use your Knowee card as the signature for your emails and use our Signature Creator. Scroll down any card's page and you will find a button "Create signature". You can copy/paste the thumbnail image and/or text of your linked Knowee Card in most word processors, email readers, presentation software (like PDF or Power Point), etc. or even in your website. Remember that your card's Knowee code is a direct link to your card (know.ee/YourKnoweeCode) and you can include it anywhere. You can also include your linked QR code so the user can click on it or simply scan it to open your card. I misspelled part of my card, can I change it? You can as long as you have not shared the card yet. As with physical cards, when you change a card you are actually creating a new card and Knowee will assign it a new code. Those who you shared the card with will not see the new card unless you share it again with them. See discussion here. What happens with my old card? Remember: Knowee codes identify unique cards, so your old card keeps the original code and is still available to share. You can delete it from “My cards”. Contacts who received your card in the past now see the card with the indication “Obsolete”..
What can I update from my card without getting a new code? You can change the pictures of your card, including your portrait and the front and back of your physical card. Those who you have shared that card with will now see the new pictures. Any other change in the card will create a new card and will receive a new Knowee code. Who can see my card? You are in total control about who can see your card. If you give your card or if you share your Knowee code or your QR picture, you are sharing your card with exactly the same consequences as you do with your physical card - those who you shared your card with can see it. Simple. What if someone guesses my Knowee Code? It is very unlikely to guess a code: there are about one million of millions of millions possibilities. If you were lucky enough to type in a correct knowee code, chances are that the card you reached is not relevant to you at all and would be equivalent as finding a business card lying on the sidewalk. In addition to this, we have implemented security measures to ban access after several attempts. What if somebody makes my Knowee Code public? This is the exact same situation as with a physical card. A physical card can also be made public. Can I see other people’s cards? Yes, as long as you know the corresponding Knowee Code or you scan the QR code or you upload a physical card that has a Knowee or QR code to the Knowee website. Basically, you can see cards that have been shared with you. Do I have to type the Knowee Code? That is one of the many options. If the QR code is present in the card, you can scan it and if the card has the Knowee code printed, you can picture the card and upload it. There are some cards I don’t want to keep, can I remove them? Yes. You simply click “Trash” and it will be removed from your card holder in the same way as if you throw a physical card to the bin. How can I find a card in my Card Holder? This is some of the nice functionality of Knowee. You find cards searching by any field available (name, company, city, etc.) and also by date and location that card was exchanged. E.g. you may want to find the cards that you were given in Seattle or in March 2011. Can I keep cards whose owner has not created it in Knowee? Not at this time. All cards in your card holder must have been created in Knowee and data filled by the owner. Once in Knowee, each card has a Knowee code that can be shared with you. Then you can view that card and store it in your card holder. I want to drop from Knowee. How? You just have to click in "My account" at the top right of the page and click in "Cancel account". Please, keep in mind that all cards you have shared with others will still be visible to them as physical cards would do. How will my data be treated? All data will be treated as confidential by Knowee. You only share the information you decide when you decide and with who you decide as you would do with traditional cards. Know.ee will never use your data to share or sell it to third parties and will only be used to provide the service. We also hate spam and will never transfer, lend, sell or share any email address to others and Knowee will only send you emails to confirm your account, to inform you of relevant updates to the service and notifications based on your settings within the application. What is Knowee Meeting Point? Available soon. Meeting point is a Knowee powered feature that allows the attendees of a meeting/event to share their business cards with each other before they actually attend to the meeting. This way, every guest will know in advance who he or she is meeting and even store the cards automatically in their respective “Card holder” to make use of all the power of Knowee in viewing, sharing and managing cards. It’s easy and straight forward. When the organizer appoints a meeting using any of the comercial available tools like Outlook, Gmail, Notes, etc. and invites all guests, he or she appoints another ‘virtual guest’, the Knowee Steward, who@know.ee. The Knowee Steward will know who's invited to what meeting and will send an email to the invitees offering each of them the list of cards they have available in Knowee to share. Each attendee selects the card to be shared (or none) and the rest of the attendees will receive an email form Knowee Steward with the card for that meeting. They can then view or download the card as a contact or introduce it in My Stack in Knowee. No problem. If you don’t want to share your card for the meeting, simply ignore or delete the message from the Knowee Steward that offers you the list of your cards. You will still receive the cards others shared for the meeting. I am not registered in Knowee. Does it still work? Yes. As you are not registered, you have no cards to share. However, you will be sent the cards shared by other attendees. You can view or download them as contacts immediately. You can also register and create your card at this time to share it. If you are the meeting organizer, it still works. Simply invite the Knowee Steward, who@know.ee. I created an event and forgot to invite the Knowee Steward. Can I fix it? Yes. If you don’t invite the Knowee Steward, Knowee does not know about that meeting. Simply add it to the meeting anytime and it will take care of asking for cards and sending them to the invitees. I selected the wrong card for the meeting. Can I change it? This is the same situation as if you realize you gave the wrong physical card to someone. You gave it, there’s no polite way to retrieve it. However, you can give the correct one any time by clicking the right one. There have been changes in attendees since the original appointment. How does it work? If new attendees are appointed, they will receive the card selection email if they are registered in Knowee when the meeting is updated. If they are not part of Knowee they will still receive the cards of the rest of the attendees. It can be useful to know who was supposed to attend in the first time. Does Knowee replace the Google/Outlook/Notes appointment emails? No. It all works as always. If you use Knowee you will receive a card selection email and other attendees’ cards from Knowee. Any updates to the meeting are managed by the appointment client you used in the same way. Know.ee complements this functionality. The meeting was cancelled. What happens with the cards shared? Exactly the same as if they were physical cards. If you shared your card, they can access it. Do not worry. The philosophy behind Knowee is that we keep your cards separately from your personal-phone-pc contacts and have them all sorted and easily accessible. At any time, you can download any card to your iPhone or Android device or even your Outlook contacts just by clicking a button. I don’t want any card sharing to happen for this meeting. How? Simply do not invite the Knowee Steward. Know.ee will not know about the meeting. No problem. You can create a rule in your email manager to store all emails from Knowee in a specific folder for easy management. All our emails are clearly identifiable by the subject. If you need we can help you with this. How does Knowee work with Google, Outlook, Notes, etc. for meeting appointments? Independently. Know.ee does not care the service you used to create the meeting. If you invite the Knowee Steward, it will be part of the meeting and will keep track of the other attendees to help you share your cards. That’s all. This is just a service to help you know in advance the other attendees of the meeting and to help you manage cards in a nice and useful way. Of course, you can share your hard copy card in the meeting as we have always done. You can download any card from your Card holder or from My Cards to your PC as a contact to your preferred contact manager software like Outlook©, Lotus Notes©, Eudora©, etc. Know.ee will match all data to the corresponding fields in your new contact. Note that no picture is included in the contact. We are currently working on this feature that will be available soon. In the meantime, you can include a picture saving the picture to your PC/device from Knowee and loading it from within the contact itself. It’s easy and straight forward.Simply click "Keep as contact" from the card's page and the contact will be downloaded to your device in the appropriate format. If you are viewing the page from a Windows or Android system, the contact will be downloaded as a VCF file. If you are using iPhone, iPad or MAC desktop, the card will be downloaded as an ICS file. You can also manually download the file as vCard file, vCard file for outlook os as a CSV file clicking in "Card options". This feature allows you to export contact data of any card to your Gmail/Yahoo!/Outlook.com/Exchange contacts. Google/Yahoo!/Outlook.com/Exchange login information is required to write the contact to your list if you are not already logged in. Sign up, create your card and share it.